DIVA, Virtual Modular Synth from U-He. 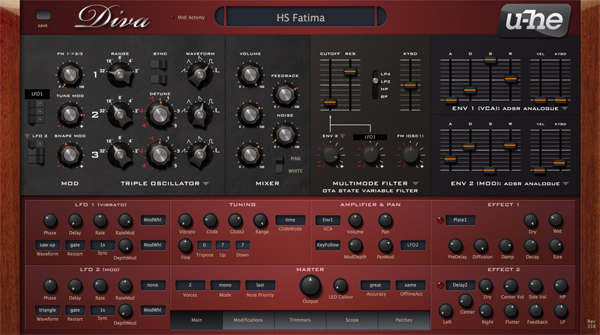 U-He offers a new v1.3.0b2 beta version of his Diva virtual synth on Mac OS X and Windows. This new beta update brings a digital oscillator based on the JP80x, a Uhbie filter modeled on the SVF and an Arpeggiator and Clock module. This new version also adds AAX 32 and 64-bit plug-in format for Pro Tools 10 and 11 and the graphic loading is now faster. You can download the 1.3.0b2 Beta here for Mac OS X and there for Windows. GarageBand updated on both Mac and iOS Apple unveiled yesterday its new iPad Air, the OS X Mavericks, and updates for the occasion its GarageBand on iOS and Mac to version 2. AudioCopy is a free app on iOS 7 The AudioCopy feature, that allows for audio copy/paste between iOS apps, is now available as a standalone app on iOS 7. A steelpan library for Kontakt Indigisounds is a new company based in Trinidad and Tobago who used the local folk instrument to create its first sample library for Kontakt.